Tired of the same boring company get together? We would love the opportunity to host a unique event for you. Think how fun it would be to try over 100 different handguns and rifles and be able to shoot a full auto FN Scar chambered in 5.56 Nato or a full auto Colt AR-15, chambered in 9mm Luger. If you want the total experience of full auto firearms, we have the select fire FN Scar chambered in 7.62 Nato that gives the shooter an experience like no other. Carolina Sporting Arms can provide a unique and fun opportunity for your company. Not only are you practicing handgun and rifle skills on our state of the art lanes, but you are getting to experience team building in addition to relieving stress and having fun. 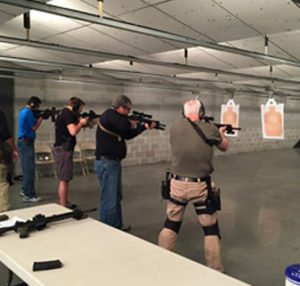 Carolina Sporting Arms has 7 pistols lanes, 7 rifle lanes, a state of the art ventilation system for cleaner air for the shooters, individual protected shooting stalls, a down range ceiling baffle system, and certified Range Safety Officers for your needs and safety. In addition to the range, we offer an over-sized classroom that can be turned into a party room making your event private. Employees will never forget this unique experience! All packages require a 50% non-refundable deposit to secure the reservation. All events need to be booked a minimum of one week in advance. If you book an event from 10:00am – 12:00am or 2:00pm – 5:00pm you will have access to the entire upstairs rifle range for your private event. Ammo and targets can be purchased the day of the event. Call (704) 228-3615 or email us to get started!